The holidays.... A time for family and friends, sparkle, celebrations, gifts and of course lots of eating. This is the time of year when diets go out the window, justified with upcoming New Year's resolutions, and food is present at every get together. It was no exception for me this holiday season. I bought myself a little inspiration to help get the cooking and baking started. Don't ask me how many recipes I actually used from these books, but just flipping through them gets my culinary juices flowing. On Christmas Eve (or Erev Christmas as we like to say) I decided to make a classic beef brisket, in the tradition of my grandmothers, aunt and mother. I called for the recipe, and my mother gave me the rundown on how to make it. We don't actually use measurements, its "a bit of this", and "lots more of that". I would describe this type of cooking as intuitive, and you need to understand the ingredients and how they work to ensure you are using them to their full advantage. Also, it takes lots of practice. I learn something every time I cook, and I add it to my repertoire for future dishes. This brisket recipe calls for onion soup mix, garlic powder (fresh garlic would burn in the oven for so long), onions, carrots and celery. And the secret ingredient that my mother insisted I need? Colman's dry mustard powder, in the yellow tin, imported from England. I rubbed down the brisket with the dry ingredients and some oil, then placed it on top of the sliced vegetables. I filled the bottom of the dish with red wine (a pinot noir, not the Manischewitz typically used), and let the whole thing cook for 4 hours. I love brussel sprouts. Is that odd? They are especially good roasted with chestnuts. A very typical holiday flavor if you ask me. 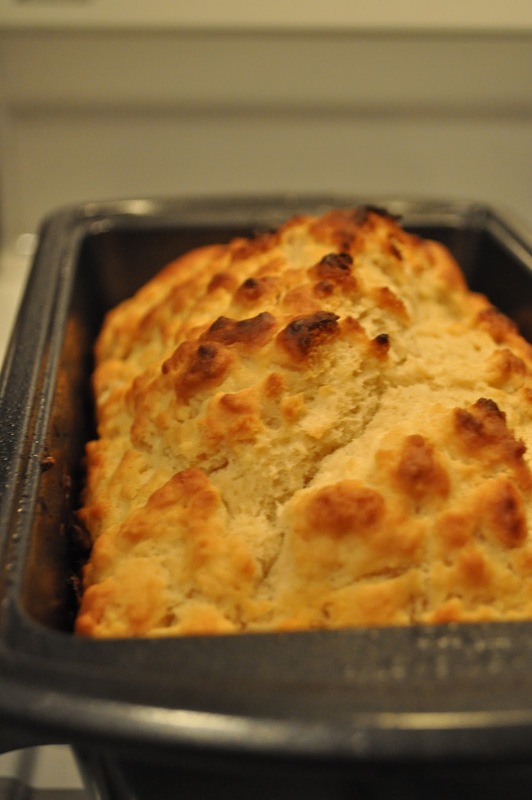 Beer bread, made from a Trader Joe's mix. Beer bread is a quick bread (which means it doesn't need yeast similar to muffins or banana bread), with beer used as the liquid. The flavor is subtle after it is baked, but you can definitely taste it. The brisket, four hours later. I know it doesn't look so pretty and no matter how I tried to photograph it, the camera didn't do it justice. But it tastes so good, who cares how it looks?!?! 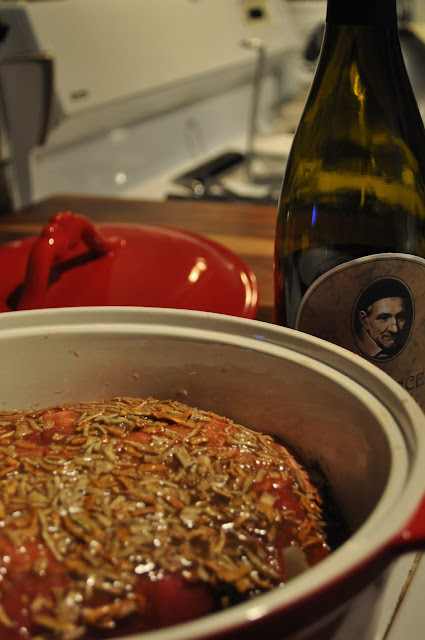 The onions soaked up the wine and the meat is fork tender and packed with flavor. Simply delicious! And if I may pat myself on the back, it came out almost like Mom's. If certain flavors have a time of year to shine, this would be the time for peppermint, with all credit given to the candy cane. Candy canes are everywhere, from hot chocolate and lattes, to cookies, cakes and even martinis. During our last trip to Vegas, we discovered the Mistletoe Martini and I was determined to duplicate it at home. First step, make candy cane vodka. It was really simple to do. 2) Drop into a bottle of vodka. 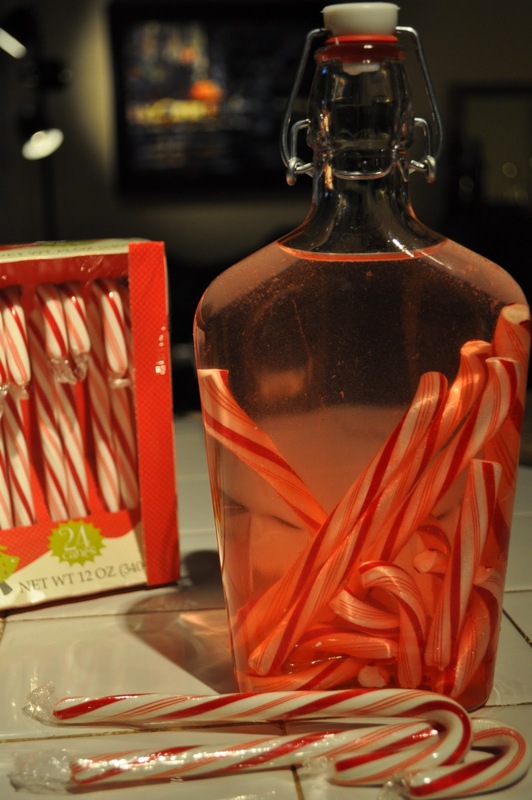 By the next morning the candy was dissolved, the vodka was pink, and it tasted like Christmas. 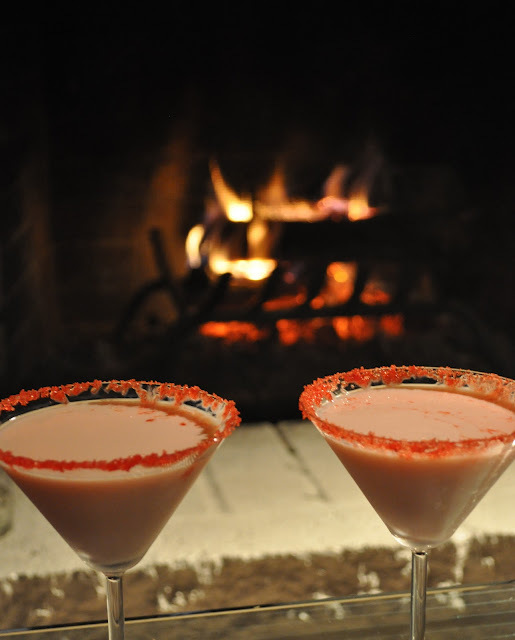 Mix the candy cane vodka with 2 parts Godiva white chocolate liqueur and pour into a candy cane rimmed martini glass. Add a splash of creme de menthe. 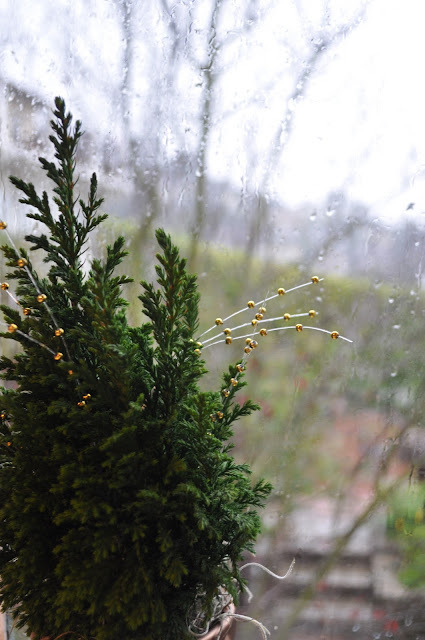 On Christmas Day, it rained and rained and rained some more. What a perfect excuse to stay indoors by the fire where it was warm and cozy. 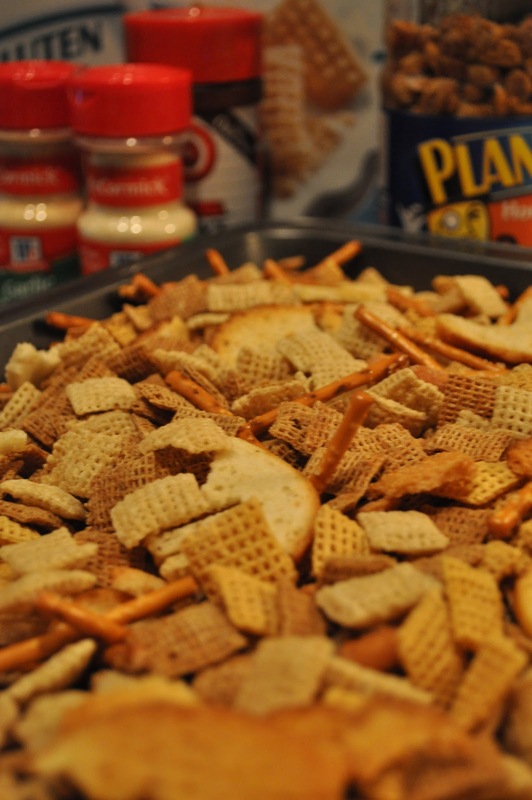 One of my favorite "meals" is cheese, crackers, veggies, dip and other little noshes. 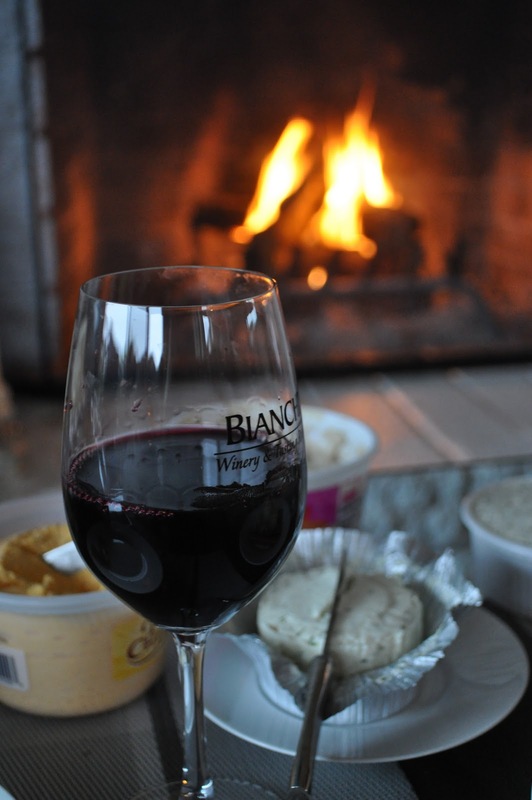 Add a bottle of wine, a good movie and my wonderful boyfriend, and I'm in heaven. And for my boyfriend, it wouldn't be the holidays without home made Chex Mix. He has fond memories of the smell filling up his childhood home, and so we re-created it here. I didn't realize that it takes an hour to bake, but it was well worth the wait. Ready for a re-match? I hope all your holiday flavors were as wonderful as mine. Happy New Year! The food looks delicious. The brussel sprouts, which are not everyone's favorite veggie look amazing. The brisket has that melt in your mouth looks. 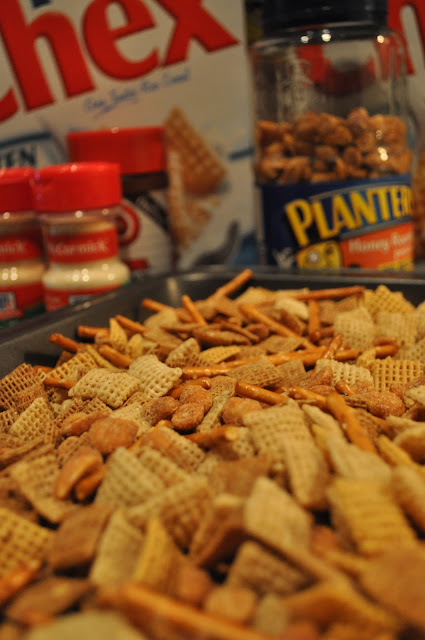 Would love to have the recipe for the Chex Mix - great for a party. I've never had Brussels sprouts with chestnuts. What did you use to season with? The Mistletoe Martini sounds great!! What a great idea!